Braille Institute’s Johnny Mercer Adult Music Program is celebrating two decades of support from The Johnny Mercer Foundation in Los Angeles and offers a variety of instructional, education, and performance opportunities free of charge to adults 18 years of age or older who are blind and visually impaired. 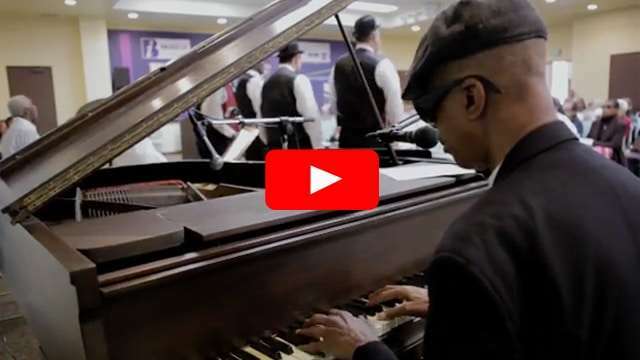 Through the program’s music-based education and performance opportunities, adults from Los Angeles who are blind or visually impaired, discover that vision loss is not the end, but the beginning of a new way of living. All elements of the program are free, made possible in part through the support of The Johnny Mercer Foundation with additional support from the Pasadena Showcase House for the Arts and the Flora L. Thornton Foundation. The classes offered through the Johnny Mercer Music Program are always favorites for students, volunteers, and our communities alike. We invite you to learn more about joining or supporting this program. For special programming developed to mark the 20th anniversary click here.